So, why is getting the best arrow rest for your bow so crucial? When asked about the accuracy of their archery gear, most bowhunters would begin to talk about archery sights or maybe even shooting form. What many hunters fail to realize is the impact an arrow rest can make on accuracy. Arrow rests, like most bowhunting equipment, have come a long way in the past 10 years. As we begin to better understand the flight of our arrows and the situations under which we regularly use our bow, it becomes clear that selecting an arrow rest is no easy task – especially for the beginner in bowhunting. What arrow rest type should I choose? What is the “perfect” arrow rest? The premise behind an arrow rest is to stabilize the arrow until it is released from the string. The fletching or feathers on your arrow shaft must clear the riser of your bow to avoid making the arrow wobble or twist in its flight to the target. This is where an arrow rest comes in. Arrow rests serve as a launching platform for your arrow. There are several arrow rests to choose from and the right one for you will depend on how you fire your bow and the type of shooting you are planning to do. Once these factors are determined you will find it easier to choose the best arrow rest for you so your arrows consistently hit the target. Whether you are a target shooter or hunter you need to be able to consistently make accurate shots, and this arrow rest might be exactly what you are looking for. It features a “break away” design that won’t interfere with the path of the arrow, and it can also make the bow safer to draw and release. Its sleek design looks great mounted on the buss capable, and it also won’t affect the balance of the bow. It also comes with a capture bar that is curved so you can easily fire horizontally and vertically. This arrow rest is easy to adjust, even after it is mounted to the bow. The timing cord can be shortened or lengthened according to the distance of the target. To help ensure each shot is accurate this arrow rest comes with vibration technology, which also helps to minimize the amount of noise produced when the bolt is loaded. The lack of vibrations also helps your arrows to fly straight along the string’s flight path so each shot consistently hits the mark. Constructed from durable and lightweight aluminum and stainless steel, this arrow rest is designed to last through years of target shooting and hunting. All in all this is propably the best drop away arrow rest. If you need extra assurance that the rest won’t interfere with the path of your arrow, this model might be exactly what you are looking for. It features a “drop away” design that ensures it won’t touch the fletching or shaft when the arrow is released. Watch each arrow fly straight and hit your target, even when you are shooting down from a tree stand. The arrow rest is also easy to install on your compound bow, even when you are out in the field. There are several reasons why avid bow hunters prefer using this arrow rest. Its camouflage design allows you to blend seamlessly into your surroundings, and you will appreciate how quiet this arrow rest is to load. The rubber dampeners effectively silence any noise so you don’t have to worry about startling your prey when you are taking aim. It also comes with durable bushings that are sealed to help increase the speed of the arrow when it is launched. It is designed to prevent any “bounce back” that could throw off your shot, and you will appreciate its consistent performance. Capable of securely holding your arrow at the nock point this rest could help you improve the accuracy of your shots. There is very little not to like about this arrow rest. Designed for hunters, it is durable, easy to adjust and extremely quiet to load. The arrow rest also comes in a camouflage design that blends in seamlessly with your surroundings and the rest of your gear. It features a “drop away” design that ensures the rest won’t interfere with the path of your arrow so every shot is perfectly aligned. It is also designed to securely hold your arrows horizontally and vertically so you can accurately shot from the ground or up in a stand. The sound dampening system ensures that you won’t startle your prey when you are loading your arrow, and you will also appreciate how easy it is to make minute adjustments when you are out in the field. You do not need to worry about bringing additional tools, simply set the rest with the help of the laser graduations. This arrow rest also comes with a durable metal construction that can easily withstand the rigors of hunting in all seasons. It is resistant to rust and corrosion, and designed to last for years. Sometimes you need to be able to shot shorter arrows and this rest is designed with this in mind. Capable of securely holding arrows shorter in length, you can easily get the speed and accuracy you need to consistently hit the target. This arrow rest also comes in an attractive camouflage design that is perfect for hunters that need to blend into their surroundings. The “break away” design ensures that nothing will interfere with the path of the arrow, and since the shaft isn’t touched it is easier to make accurate shots. 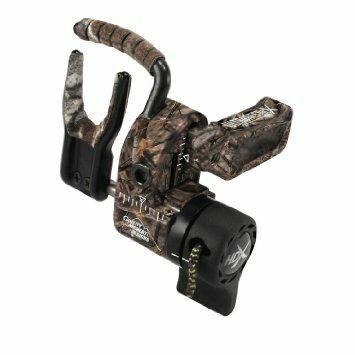 It is capable of securely holding arrows for vertical and horizontal shots, which means it can used on the ground and in tree stands. The arrow rest is also designed to be silent when loading so you don’t have to worry about scaring any game away. Hunters will appreciate the durable aluminum and stainless steel construction that ensures this arrow rest will last for years. It is extremely easy to mount and adjust even out in the field, though it should be noted that this arrow rest is intended for use by right handed shooters. This arrow rest is a popular choice with compound bow hunters, and it is not hard to see why. Its camouflage design allows it to blend in with the rest of your hunting gear so you can easily hide from your prey in the brush or hunting blind. It features a lightweight construction that won’t interfere with the balanced feel of the bow or contribute to arm fatigue that can be a problem for some hunters. You will appreciate the durable brushes that are also easy and cost effective to replace, along with the arrow rest’s versatile design. It can be easily used by right and left hand shooters so you don’t have to sacrifice comfort in order to make accurate shots. This arrow rests is designed to securely hold the arrow in place even during draws, even when you are shooting down from a tree stand. Capable horizontal and vertical adjustments, you can easily use this arrow rest in a variety of situations. It is also designed for minimal interference so you know your arrows will fly straight when released. This fall-away rest is quite the hit with archers everywhere and for all the right reasons. The most important is that it provides 100% containment, which means the dry shots and premature release are out of the question, which is something that many novices can appreciate. But that’s not by far the only advantage this arrow rest offers. As it is made of aluminum, it is lightweight, and it will not create an extra burden for your hunting gear. A clean break is what makes this arrow rest such a good choice. Your arrows will not be hindered by anything on their way to their targets, and that is definitely something any archer can appreciate. Regarding quality, you will have nothing to worry about. Made in the US, this arrow rest complies with the highest quality standards. Other benefits must be listed here. For instance, the internal brake will make sure that you won’t get the usual bounce back. That, again, is something that helps with increasing your accuracy. Another thing you’ll like about it is that it is entirely silent, and you won’t have to use moleskin to make it quieter. Any hunter can thoroughly appreciate that. A plethora of benefits makes this arrow rest one of the most convenient, easy to use, and reliable models on the market. You can use it if you’re a left-handed archer or a right-handed archer, with the same results, and its versatility is just the first thing on a long list of advantages. Adjustments for the windage and elevation are possible, which means that the possibilities to customize the arrow rest to fit your style and preferences are endless. A design that has stood the test of time, it has been around for almost twenty years, which is not something that can be said about most of the competition. A great thing about it is that it can adapt to bowhunters of any level, so it won’t be a problem if you’re a novice or a seasoned hunter and you want to give the Kill Shot a try. The composite-encased biscuit is more durable than on previous versions of the arrow rest. That means that you get an even more reliable product, and you can rest assured that your performance in the field will increase. Also, loading your arrows using this rest is entirely silent, and you don’t have to worry about disturbing your prey. There are a few advantages this model offers that we must outline here. First of all, because it is made from aluminum, the arrow rest is very light, so you will not feel encumbered in any way while using it. You will appreciate the fact that you can use it for left-hand and right-hand bows, without losing anything from its efficiency. Another advantage worth mentioning is that the arrow rest will work without running the risk of damaging your arrows. That is a great plus, as some arrow rests when misused, can hinder you from shooting straight. The full contact design ensures that you get extra safety and stability. That means that you don’t have to worry about dry shots. You will be in total control of shooting your arrows, and this arrow rest is here to help you achieve extra accuracy and consistency. You can correct the deviation or elevation of your arrows to perform a good shot each time. This arrow rest is a must have for many bowhunters, and it presents plenty of advantages that you cannot overlook. Versatile and comfortable to use, the Aketek Arrow Rest for Compound Bow is a recommended choice. There are a few things any arrow rest must do. One of them is to hold your arrow until you’re ready to launch your shot. Shooting too early, or without being able to keep a straight line, will definitely have an impact on your accuracy. But that will not happen if you use this particular arrow rest. You won’t run a risk of premature shots, and you will also be able to work on your accuracy. Other features present in this model will help you achieve the same goal. For instance, you can make corrections using the windage and elevation customization options. Also, you will be able to use reference marks, which, again, will help you when out in the field. And here’s another reason why you should consider this model. The arrow loading happens silently, due to the rubber boots on the rest that will prevent any contact of metal against metal. For bowhunters of all skill levels, this is a great must-have. You will like that the arrow rest is easy to attach. The fact that it has a beautiful appearance helps, as well. In case you are wondering what tools are needed for installing it, the Allen wrench necessary is provided with your purchase. What features are you looking for in an arrow rest? No matter your answer, the Tabiger Arrow Rest for Compound Bow might be able to check all the boxes. For starters, it works for left-handed, as well as right-handed bowhunters. You will also be able to adjust the windage and the elevation, to acquire maximum accuracy, depending on shooting conditions. Regarding durability, you should know that the biscuit encasing is sturdily built. You won’t have to worry about anything wrong happening to your arrows, as the design is thought in such a manner that no harm will come to your fletching. The reference marks will help you achieve more accuracy with each shot. Also, the rubber boots will prevent any contact of metal on metal so that loading your arrows happens as silently as possible. Should you encounter any troubles with your arrow rest, the manufacturer offers customer service that you can make good use of, to solve your issue. Also, you will get a 30-day money back guarantee with your purchase, so that you can return the product without any problems. Seeing how durable the product is, you might be happy with it right from the start. There are many types of arrow rests on the market, but you can break them down into a few basic categories. Shoot through, drop away, and standard rests encompass most of the arrow rest choices on the market today with a handful of arrow rests combining these attributes and graying the lines a bit. Shoot through rests are my preference – in particular the Whisker Biscuit style rest. This rest uses a disk of stiff bristles with a hole in the center that your arrow shaft fits into. Many of the early problems with the biscuit style arrow rest ripping fletching form the arrows are gone now as the bristles have been engineered to better suit the needs of the archer. These rests keep contact with your arrow until the very end of its flight from the bow string providing maximum stability before the arrow takes flight on its own. Since it touches the arrow until the last minute some would argue that if you have poor shooting form like dropping your arm after a shot, the arrow rest will magnify that problem downrange on the target. I haven’t found that to be the case, but the argument makes sense. You will lose about 2 feet per second (FPS) of arrow speed with this type of rest. However, I will tell you that it is easily adjustable, it holds your arrow securely which is great in a tree stand, and is quiet to shoot. Not a lot to go wrong with this arrow rest which makes it very popular. Check our reviews below as a guide to choosing the best whisker biscuit arrow rest. Drop away arrow rests are new on the market and do just as the name implies – they drop away before the fletching on your arrow passes the arrow rest, so no contact is made with the fletching. The rest is attached to a small cord that as you draw your bow, pulls the rest into position. Many new archers have trouble keeping the arrow on the rest as they draw, and it does take some practice. The upside to this arrow rest is that it has absolutely no contact with the fletching of your arrow, however, you have to tune the arrow rest precisely so that it drops at just the right moment or you will not have enough contact with your arrow shaft to ensure stable arrow flight downrange. It can be tough for the beginner. These arrow rests will also allow you the maximum feet per second (FPS) in arrow speed because they have so little contact with the arrow. If you need help choosing the best drop away arrow rest, keep reading. Standard arrow rests are typically a flipper or two prong design that has your arrow sitting on a small, usually spring loaded arm made from a wire or metal covered in plastic to deaden any noise. Your arrow makes contact at some point with the rest so many of today’s bows shooting at faster speeds struggle with these arrow rests. They are very forgiving to poor shooting form and are generally easy to tune, but the technology has simply moved beyond them at this point. The new shoot through and fall away arrow rests provide the opportunity for much better arrow flight and accuracy. Choosing the right arrow rest is essential if you want to experience the full potential of your compound bow. It should be compatible with your shooting style, along with the type of arrows you use. You also want to consider whether you are hunting or target shooting, since this will help determine which arrow rest is right for you. Before you rush out and pick the first arrow rest you see there are a few factors that should be considered. If it were possible to find a perfect arrow rest everyone would be able to make accurate shots consistently. Your arrow would always be securely held in the same position, regardless of the angle of the bow. The arrow rest would also be quiet, which is important when you are hunting. The perfect arrow rest will be capable of a consistent release, and have almost no contact with the shaft. It would also be durable and easy to adjust, along with coming at an affordable price. Unfortunately there are not any “perfect” arrow rests, instead compound bow owners need to concentrate on the features that are necessary for their style and type of shooting. What is the best arrow rest for hunting? Compound bow hunters need an arrow rest that is durable and able to securely hold the bolt in a level position or pointed down if you are firing from a tree stand. You also want it to be able to hold the arrow in place when you draw the bow. If the arrow is moved even a fraction of an inch when the bow is being drawn there is a good chance that your shot will be off. Hunters also want to choose an arrow rest that is quiet so the prey isn’t startled when the bolt is released. Some hunters prefer a drop away rest which ensures that it won’t interfere with the path of the arrow, but the slightly complicated design might make it impractical for all uses. If you simply need an arrow rest to help you make accurate and concise shots on the target range there are a few aspects to consider. Since you won’t be trudging through the woods or brush durability is not a big concern, and a lightweight arrow rest is probably your best choice. You do want to choose one that is easy to adjust in between shots, and it also needs to have minimal contact with the arrow when it is released. Most target shooters prefer using an arrow rest with a “prong style”. These arrow rests are capable of helping you make accurate center shots, and can be easily adjusted even when you are in the middle of a competition. Regardless of the type of shooting you are doing, center point alignment is an important consideration. This allows the rest and nock point to line up so the arrow flies straight along the string’s path. If you typically release the string with your fingers you might want to consider the addition of plunger adjustments which will prevent any interference with the center alignment. It should be mentioned that finger shooters will want to avoid arrow rests that are classified as “full capture”. These rests are not designed to minimize contact which can throw off the center shot alignment.